Seiko Sumo JDM Version on Strapcode bracelet. WatchDogue, FunkDaLicious, zed073 and 2 others like this. desk_diver and Roarry like this. Saw this post yesterday on the Bros.
Nice piece; JDM as well! Hope you enjoy, she's a beaut ! from that majestic dial, and bezel, to flawless case, and bracelet. come from Seiko it's so impressive ! ..HUGE congrats 2 U sir !!! 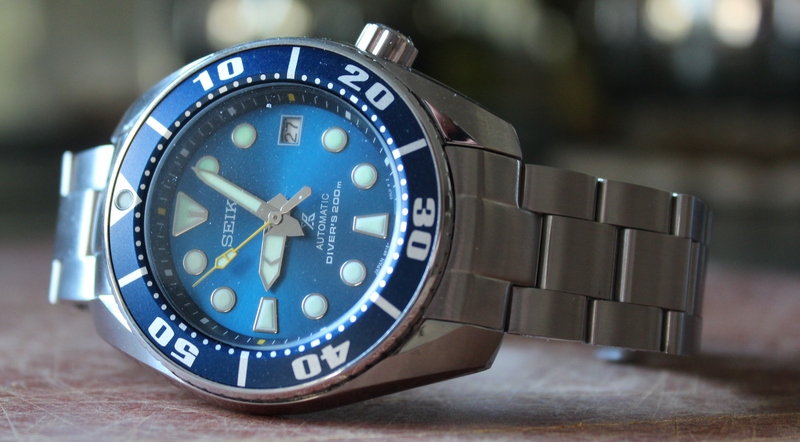 Why do you think Squale makes so many shade of blue dials? I can take m or leave em. I love Sumo's (I have the discontinued orange version). That is a great looking blue version. Anyway Citizen arrived sans springbars and strap. ends. Is this a labor intensive issue or what? under $100.00 USD. Ya'll know I'm a cheepskate. Right? Congratulations, that is a beauty of a Seiko!